Need an excuse to buy hair chalk?! Wish granted. 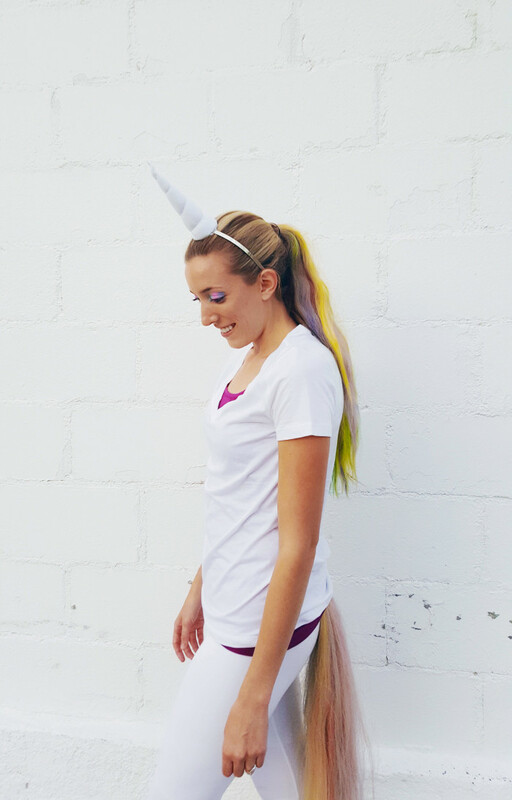 Channel your favorite magical creature with this DIY costume, a pastel rainbow unicorn! 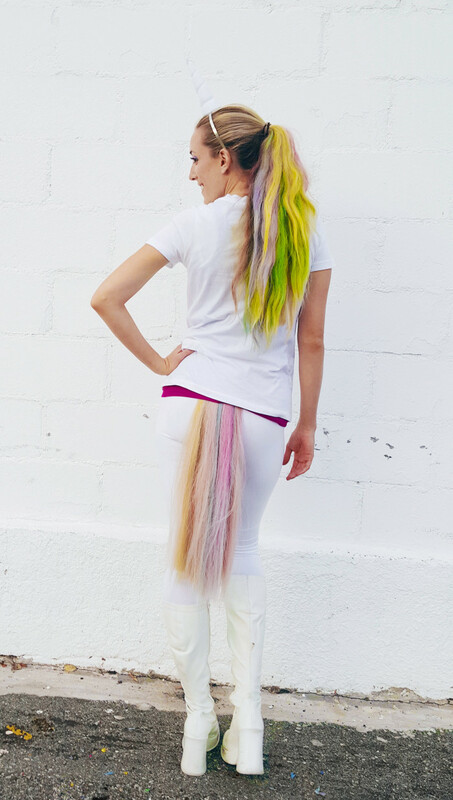 Thought a pastel rainbow unicorn costume couldn’t be sophisticated enough for an adult? Think again! This simple costume requires little put-together and can be endlessly customized. This could be an amazing family costume as well, you can all be different colored unicorns! Seriously, how cute would that be? I only have maybe one more year left of choosing what Stella will be for Halloween but all I can do is hope that when she is choosing for herself, she’ll want the whole family to be unicorns. I’d feel so successful as a parent. Even if you’re being a singular unicorn, be any color of unicorn you want! 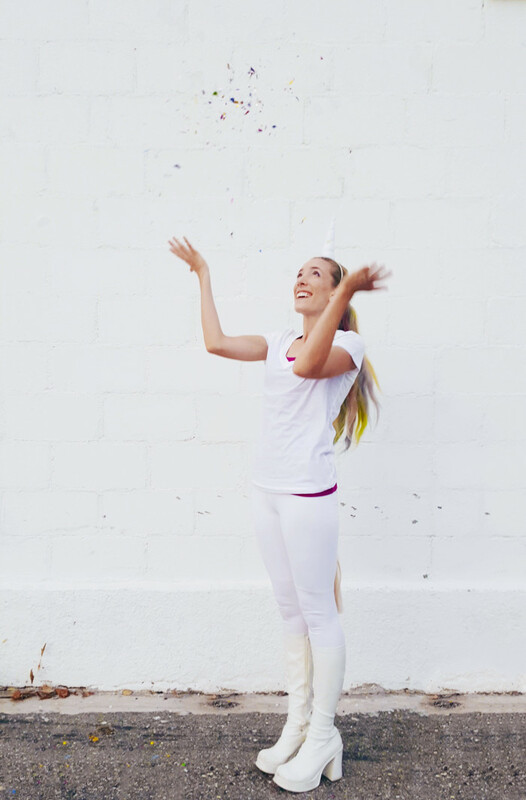 Dress yourself in pastels and be an all-over rainbow unicorn! The great thing about mythical creatures is that no one can tell you your interpretation of it is wrong. Also, being one justifies carrying confetti around with you and spontaneously tossing it in the air! For once in my life, my Halloween costume is done before Halloween Eve! I am always so pumped right after Halloween to get a jumpstart on next years costume so I don’t have to be so stressed and rushed. But, somehow, that never happens! Except this year. I knew months ago I wanted to be a disco ball. Last year I made FOUR new Halloween costumes (A sugar cookie, a lion, a party hat and vintage Princess Lolly) but the one I ended up being (the lion) was still not finished until the night I needed to wear it out! Well, my determination this year to finish a costume with time to spare finally paid off with a complete costume done the second week of September! Woot woot! I saw a couple tutorials this year for being a disco ball but they all involved wearing a big sphere around your midsection. Who on earth wants to do that!?! I want to be able to sit, fit through doors and, just in general, be comfortable on Halloween. So my take on this costume is much more glamorous, way easier and not at all awkward. 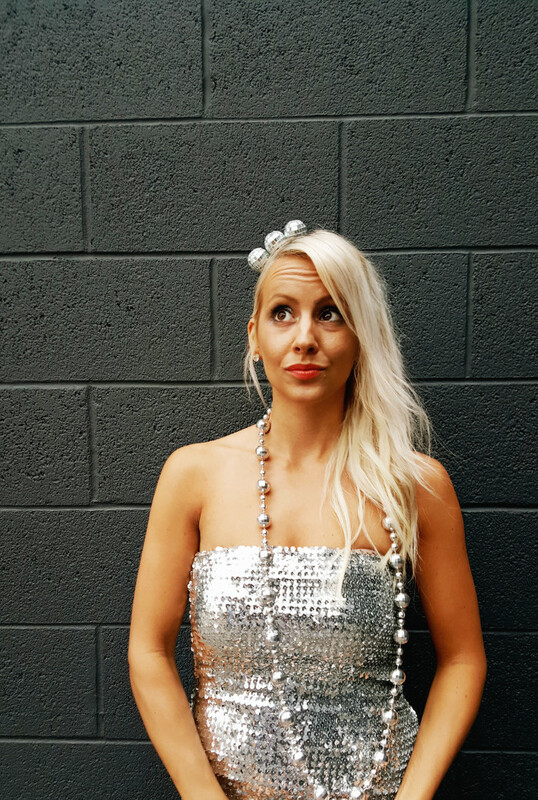 Click through to see how I put together this sparkly outfit perfect for any Halloween party. I absolutely love vintage signage and how great would it be to find an old letter from a sign that was appropriate for both your name and your home decor?! I’ve had the dream for a long time but I’ve still yet to ever find a way to collect such letters (where do signs go when they die??). Aside from being able to even find them, I doubt it’d be easy to get letters that actually fit in your home, decor/color-wise and finding letters that meant something to you. The solution for me was to make my own industrial looking marquee letter! 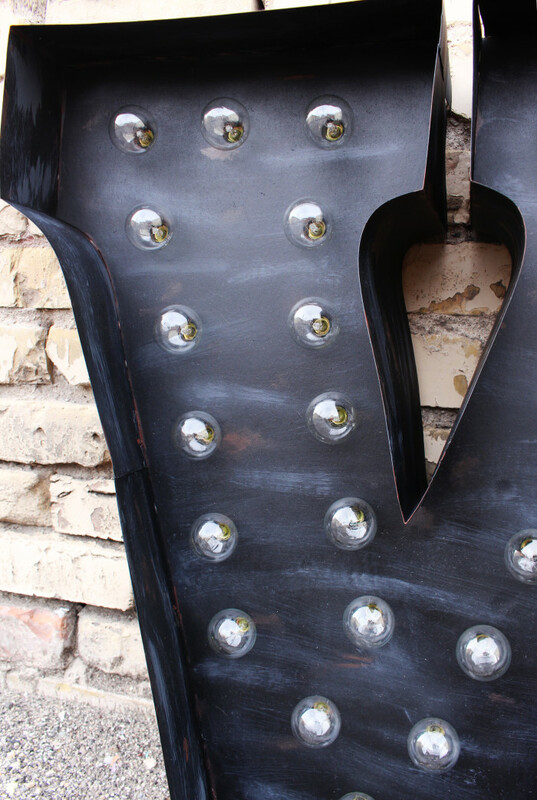 But using actual metal would be even harder than finding an old, unused sign. Firstly, metal is hard to work, it’s heavy, hard to manipulate and you can easily get cuts. Secondly, it’s heavy and I hate worrying about appropriate anchoring for such heavy items. So, instead of using actual metal, I created a faux weathered metal look via paint. What’s more, is I didn’t even use wood, I used paper! That’s right, poster and foam boards create the base of this light, providing me with a super lightweight light that looks just like the real thing but cost less than $20 and only took a few hours to make. Click through for instructions! 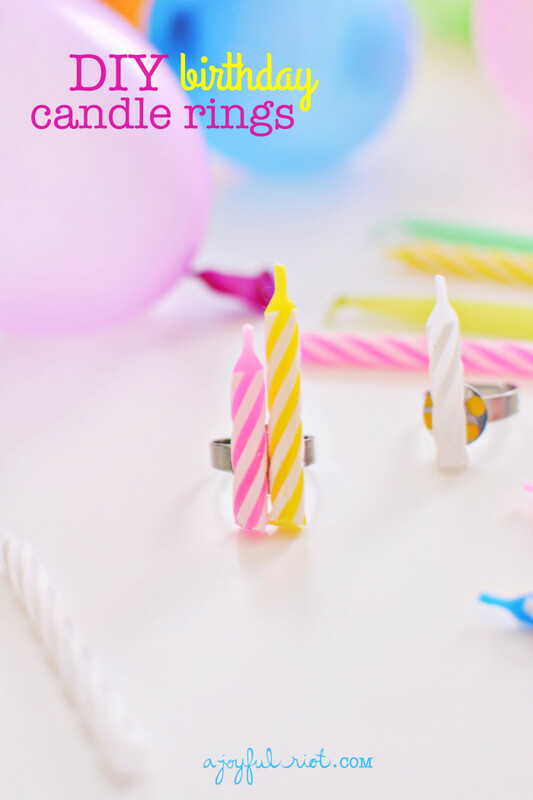 We are rounding out our birthday week with these fun birthday candle rings! Last year we used birthday candles to make gilded jewelry but this year we are going bright and using the candles as is. 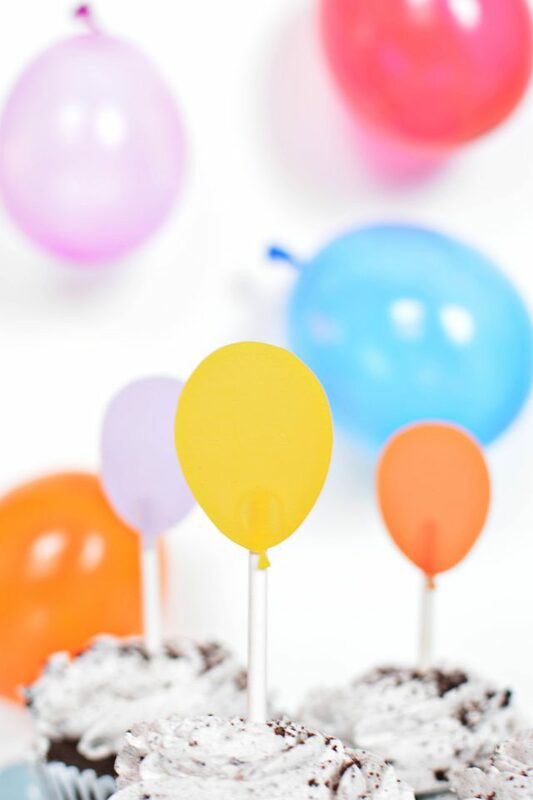 These would be great for a kid’s birthday party activity as well. They are so simple and you can make them totally unique by picking out different types of candle bases. To make the rings I used these ring bases from PandaHall – they sent us some samples for free and they made the perfect, simple base plus they are adjustable. Do you remember playing with shrinky dinks as a child?! We had the best time with them – from using them to make jewelry to just plain experimenting around. 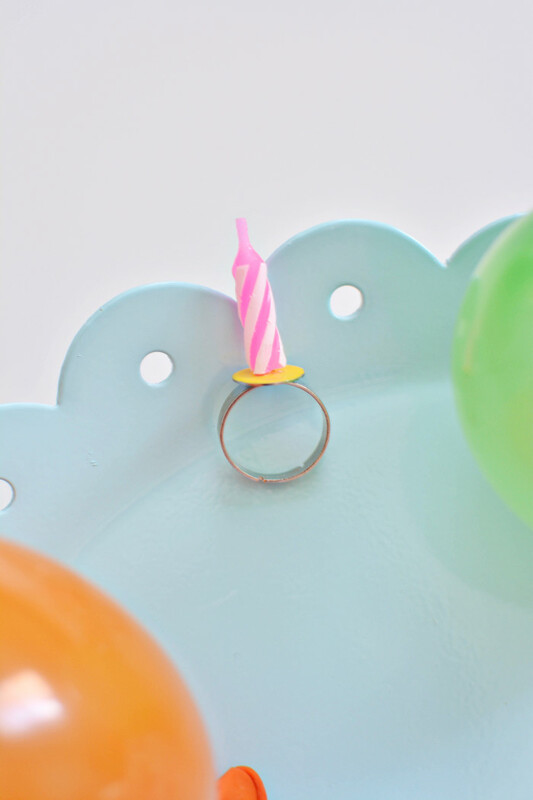 We’ve actually used them as adults a couple times (even using them for adult birthday jewelry) and have found that they have so many awesome uses, especially when you use printable shrinky dink paper. 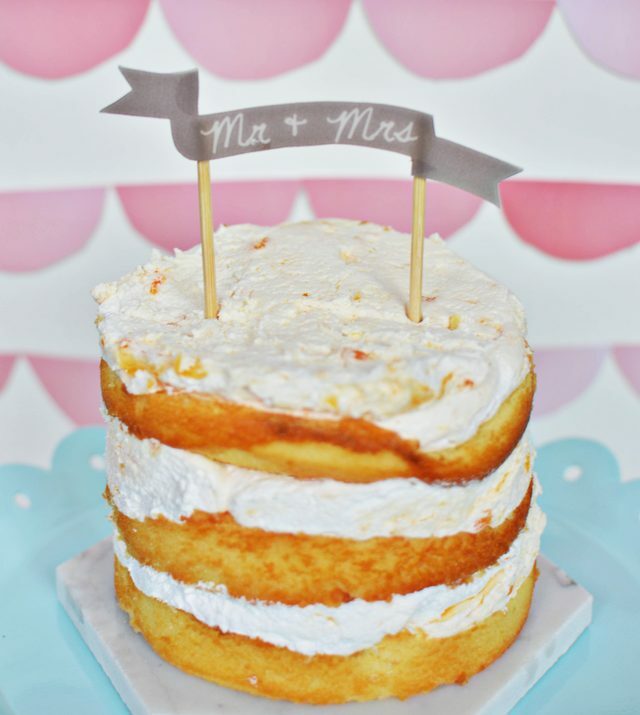 In just a few minutes you can have gorgeous custom toppers that are re-usable!